GUN WATCH: 270 Million Firearms Number Wrong; over 400 Million in U.S.A.
270 Million Firearms Number Wrong; over 400 Million in U.S.A.
Due diligence is indicated. The 270 million number is over a decade old and rather low. We know better now. The best current number is there are over 400 million private firearms in the United States. You can see the 270 million number was published in 2007. The analysis presented here relies mostly on static data, creating only a snapshot of the global firearms balance in the year 2006. There are not yet enough dynamic, time-series reports to permit a reliable sense of how civilian holdings are developing in most countries. The general global impression, though, leaves no doubt that civilians are continually acquiring more-powerful guns. There is a connection between per capita wealth and gun ownership, which is strong enough to suggest that so long as gun ownership laws are not changed, greater national wealth leads to greater gun ownership. Greater gun ownership may lead to greater wealth. The arrow of causality is not determined by the correlation. Uncertainty about the future also leads to more gun ownership. Private gun ownership increased over 30% during the two terms of President Barack Obama. The estimate for 2016 is 15.6 million, based on extrapolation from the FBI National Instant Checks System (NICS). Starting with the Small Arms Survey for the number of Firearms in the United States for 2006, the increase reported for 2007-2015 by the ATF, with the extrapolated increase from the FBI NICS system for 2016, equals another 99 million firearms. That would be 369 million firearms in the United States at the end of 2016. If we use the Congressional Research Service number for 2007, of 294 million firearms, the estimated increase would give us 387 million firearms at the end of 2016. Calculations using the methods developed by Newton and Zimring are well documented. They do not rely on surveys, and they include the number of modern guns added to the stock from 1899 to 1945. Firearms manufactured before 1899 are not included. Gary Kleck expanded on those numbers, using the same methodology in "Point Blank: Guns and Violence in America" by Gary Kleck, Table 2.1. Point Blank shows 47 million guns in 1945, increasing to 198 million guns in 1987. Point Blank received the Michael J. Hindelang Award in 1993. The number is the cumulative addition of domestic manufacture plus imports minus exports. It does not count guns shipped to the U.S. military. The figures are rounded to the nearest million. The numbers do not account for reduction of the gun stock due to wear and tear, loss, destruction or illegal exportation; or increases of the stock from illegal importation, individual or illegal manufacture, or acquisition from military sources, such as surplus sales to the private market from the U.S. military. 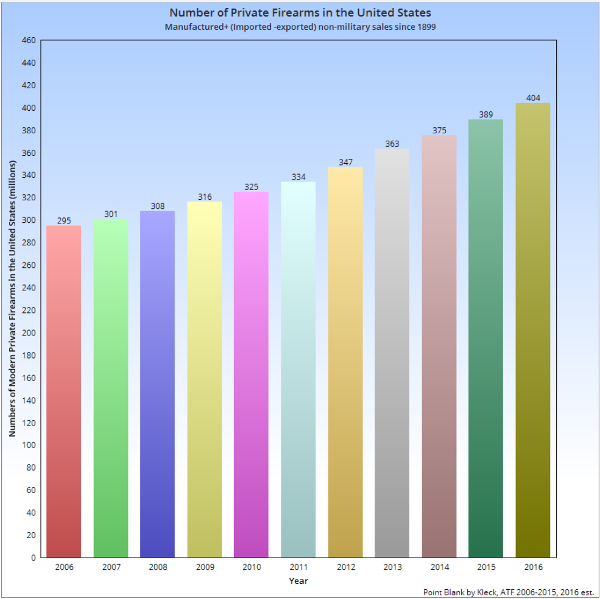 Using the Newton-Zimring and Kleck method and ATF reported figures from 1988 to 2015, gives a total of 389 million private firearms at the end of 2015. Extrapolation of the FBI NICS checks increases the stock by 15.6 million guns in 2016. That gives an estimate of 404 million guns at the end of 2016. 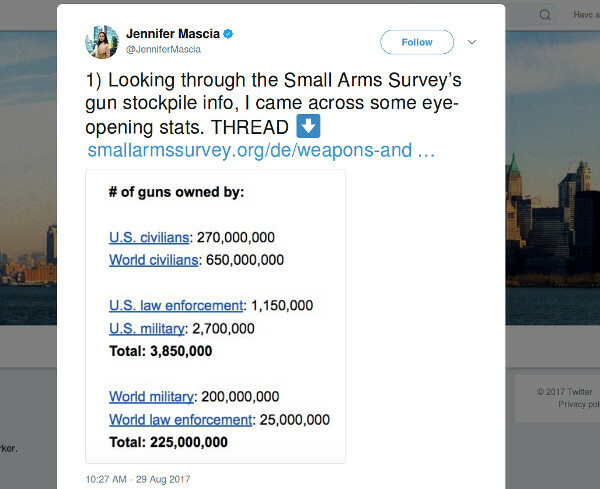 All three estimates are much higher than the 2006 numbers used for the Small Arms Survey in 2007. The larger numbers are reasonable, considering booming gun sales in the United States. Starting with the survey data from The Small Arms Survey, at the end of 2016 there would be 369 million private firearms in the United States. Using the Congressional Research Office figures, there would be 389 million private firearms. Use the methods forged by Newton, Zimring, and Kleck, with ATF and FBI figures, there were 404 million firearms in the United States at the end of 2016. The estimates are 99 to 134 million more than the outdated 2006 figure cited by The Trace.